I love blogging on www.graceembraced.wordpress.com about all the challenges life has for us and how faith turns those into positive uplifting moments in our lives. My blog www.graceembraced.wordpress.com follows my battle and triumph over breast cancer and thriving with God's grace beyond! Come journey with me. I have blogged at www.balancinglifeandfaith.wordpress.com for years and continue to do so sporatically. I have also created www.4pillarsofthechurch.wordpress.com to help adults grow in faith. I also love to share my witness with others and have a number of topics that I present on. If you are interested in having me speak to your group, please contact me from one of the websites. Please follow me…we will continue these conversations at Grace Embraced…Join Me!! Cleaning around the house recently I found notes from a Mother Daughter retreat my daughter and I led in 2006. This description of a relationship hit home with me once again. I hope you are touched by it as much as I was reading it. The mother-daughter relationship is at the headwaters of every woman’s health. Our bodies and our beliefs about them were formed in the soil of our mother’s emotions, beliefs an behaviors. Even before birth, our mother provides us with our first experience of nurturing. She is our first and most powerful female role mode. It is from her that we learn what it is to be a woman and care for our bodies. Our bodies and those of our daughters were created by a seamless web or nature and nurture, by God. Every daughter contains her mother and all the women who came before her. To become optimally healthy and happy, each of us must get clear about the way in which our mother’s history both influenced and continues to inform our state of health, our beliefs and how we live our lives. No one in your life will ever love you as your mother does. There is no love as pure, unconditional, and strong as a mother’s love. A daughter’s need for her mother is biologic, and it continues throughout her life. Not only was our mother’s body the source of life for us but it was her face that we looked to, to see how we were doing. By gazing into our mother’s eyes and experiencing her response to us, we learned crucial first lessons about our own worth. How do we balance this crazy world we live in? With the faith that we have in the Lord! When little children are killed randomly and violently? When good people tragically and unexpectedly die? When loved ones battle illness, depression and loneliness? When a soldier fighting for freedom doesn’t come home? must realize our questions may not be answered. I have heard news reporters say “it’s gonna take a long time to heal our wounds.” And it should. We lost children filled with potential, dreams, hopes and love. We should never heal. This nation has a hole in its hearts, for every child lost, for every soldier lost, for every parent lost, for every lost soul. We need to gather and hold each other through it. We need to soften the raw edges of the hole, but it can never be filled with anything but the love of Christ. The preciousness of life was cracked once again. The school did everything right procedurally and still great sadness entered the world. May we find peace in Christ, who is Peace. Because the peace of God surpasses all understanding and will guard our nation’s heart. Today’s a new day, a fresh start to a life anew. Each of us have this opportunity every day. We are given a new day to use it as we see fit. Will we do something worth while or waste it way? Don’t throw this new beginning into the wind. Embrace it as a gift and open it slowly. 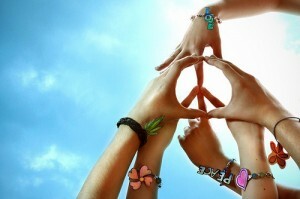 Allow the world to wrap its arms around you and leave pieces of peace throughout your day. When you open yourself to positive energy flowing within you, love and happiness spreads to everyone around. 1. Be kind. You may not know what the person you meet is dealing with. They need a kind word or smile. It will make a difference in their life. 2. Build relationships. A true relationship takes time, patience, effort and compromise. Whether a friendship or intimate relationship, treating each other with respect is essential. 3. Stretch yourself and grow. Never fear what stretching may do to you, you will always grow from new experiences. The potential is unlimited in what you can achieve. 4. Be grateful. Grateful for what you have and what you don’t have. There is a reason you do not have everything. Life is about graces that are given us, when we truly appreciate them we are filled with more. If you are grateful for the blessing you will always be happy. 5. Show appreciation every day – do a daily examen at night. Look at your day and tell a loved one what you appreciated from your day. 6. Leave a path of goodness behind you – in each situation presented to you throughout your day, try to leave a good thought, good deed or good feeling behind as you leave. 8. Love yourself – know that you are a loving, caring child of God and accept yourself for who you are and who God is allowing you to become. How do we find peace through the pieces of our lives? I can’t stop thinking about all the pain that surrounds us every day. The horrific lost of life in Aurora, Colorado, the loss of a loved one unexpectedly, the loss of someone after a long illness or the devastating diagnosis of disease. What holds your life together? What keeps the pieces from falling apart? Years ago my nephew was asked by his first grade teacher what he was thankful for. He said his bones, because without them he would be a puddle of skin on the ground. So insightful for a first grader! He knew his bones were a vital part of his body that held everything together. I reflected on that with all the uncertainty in my life. With all the uncertainty in society around us. The only certainty in life, is that nothing is certain. What I know is that Christ is certain. Christ holds all my pieces together and makes a masterpiece out of my life. I only have to release the wheel and let him drive. Sometimes giving the wheel to Christ is hard to do. We are programmed from a young age to be independent and a leader. But a leader does not always be the smartest or most successful. Usually the most admired in the room is the humblest, kindest and selfless person. A trait I am sure that you would discover in each of those people is that Christ is at the center of their pieces, holding them together. As I watched the videos of families that lost loved ones in Aurora Colorado, you could see the strength of those being held together by faith. Amid the horrific and senseless loss of life, there is hope, strength and faith. Balancing life and faith in inconceivable moments – thank God He is the glue! Psalm 23:4 Even though I walk through the valley of the shadow of death, I will fear no evil, for you are with me; your rod and your staff, they comfort me. No matter what this world throws at me, I am strong because not only is Christ with me, but He has a mighty staff, He is in control. Today, my sister posted on Facebook this beautiful image for me as I go through some challenges and for her girlfriend, who just lost her 23-year-old son. Beautiful! 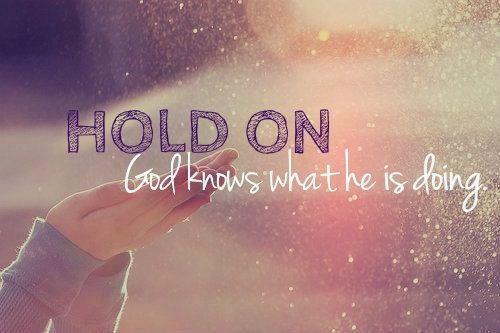 God knows what He is doing. I am a firm believer that we may not understand why something happens and we may never have the answers that we seek, but God’s plan is perfect and He is our Father who cares for us and loves us and will always protect us with His staff. So as Wilson Phillips tells us hold on for one more day…things will go your way! One thing is for certain…it is totally true is God is holding all your piece together to give you complete peace!